Be a Greenmarket Market Manager! 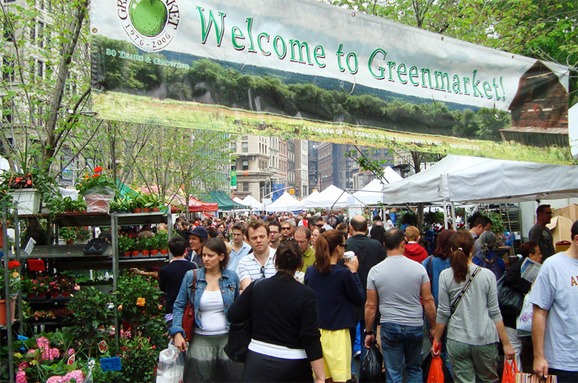 Greenmarket is currently hiring seasonal market managers to manage our 53 Greenmarkets throughout the five boroughs. Click here for the job description, and read below for a first hand account of managing a Greenmarket from former Market Manager, Kathleen Crosby. From the streets of New York, our market manager Kathleen Crosby reports back on a typical day in the life managing the Tompkins Square Greenmarket, which has been transforming a corner of the East Village into a neighborhood center of sustainability every Sunday since 1997. 4:45 a.m.: Alarm goes off. I decide not to hit the snooze button this morning, and disable two other back-up alarms. I make a strong cup of tea and breakfast: Ronnybrook maple yogurt with peaches, bee pollen, chia seeds, and grape nuts. 5:25 a.m.: Carry bike downstairs and head off. It is not light out yet and the Brooklyn roads are empty. 6:05 a.m.: I arrive at the market site, before any of the farmers. Humidity is at about 80% and Tompkins is smelling RIPE. 6:50 a.m.: The first producer of the day, Red Jacket Orchards, arrives at market. 7:20 a.m.: I set up the market info table and tent. The Greenmarket van is filled to the BRIM today with equipment. A 40 pound kettle ball falls out as I open the back door, then work to cram my 10x10 ft. tent into a 7 ft. space between a tree and sign post. Decide on which recipes to display and put out our many pamphlets and handouts. Today we’re featuring tomatoes, so I go grab a bunch of heirlooms for a display. 7:50 a.m.: Harry arrives on the scene. Harry is a long time resident of E. 7th St. and knows all the best spots in the East Village. He usually wears a hat that says "stud" but not today. I'm thinking I should get him a little button that says "Honorary Mayor of Tompkins Square." Each week, Harry helps Jimmy Stannard of Stannard Farms set up and break down, gives breaks to workers throughout the day, and greets people he knows well by howling like a wolf. His friend "Red" walks by. He howls and she howls right back. 9:00 a.m.: Plaster farmers' stands with signage promoting EBT, Health Bucks, frequent shopper promotion signs, plus signs about our upcoming Salsa-off event. 9:15 a.m.: Pam from Ronnybrook feeds me ice cream (it's a tradition we have). Today's flavor is stracciatella. 9:30 a.m.: Do the market report. Today, all the farmers have complied with the rules: on time, farm sign out, price signs out, product labels on honey, meat, eggs, etc; tents weighted down, boxes of produce not sitting directly on the ground, meat, eggs and dairy chilled. Everything is in order. While at Norwich Meadow's stand, one of the Tibetan workers hands me a hot samosa. 10:00 a.m.: Quetsy from Meredith's Bakery needs a bathroom break. I sell a few scones and gluten-free loaves of bread. 10:15 a.m.: Now to work on my a-frame sign. First the letters are too big. Erase. Then too small. Erase. A regular comes up and talks to me for 20 minutes about the history of the East Village. How it has changed! 10:30 a.m.: Finish setting up the info table. Grab some peppers and tomatoes to decorate my stand with. Swiping EBT & Debit/Credit cards and giving out tokens and health bucks. Checking off frequent shopper cards. Try to get more people to sign up for the Salsa-off. 10:45 a.m.: Pam literally spoon-feeds me some of her second batch of ice cream, strawberry this time. 11:15 a.m.: A couple of neighborhood residents who are trying to start a CSA next week approach me about fruit. I introduce him to Jimmy Stannard and they work out prices. 11:30 a.m.: Go pick up some ingredients for the cooking demo. Since we're featuring tomatoes, I grab some ripe juicy ones, a few ears of yellow corn, a bag of okra, and some hot and sweet peppers. All donated by the farmers. Arielle, my helper, chops away. I run to the local Chinese take-out join to pick up a quart of rice to serve the dish. We'll call it...a summer stew. 12:00 p.m.: Do a little social media. Walk around and see what looks good. The sun is hitting Norwich Meadow's beautiful tomatoes just right. Post to instagram, check. Post to twitter, check. Post to facebook, check. 12:30 - 2:00 p.m.: Hand out samples into tiny cups until it's all gone. I think we have some okra converts. The key is slice it thin and toss it in the pan for a few seconds at the very end. Man is it getting hot. 2:10 p.m.: Samples are gone. Now we get to lunch. I'm having some zucchini pasta ribbons with basil, almonds and pecorino. 2:45 p.m.: Harry comes over with an idea. He thinks we should put together a little box of goodies from the market and give it to the owner of the Odessa restaurants across the street. The Odessa Cafe and uber dive-y Odessa Bar have long been fixtures of the EV, but unfortunately Odessa Bar had to close its doors a few days ago. The people at Odessa Cafe have been good to the market over the years letting us use their bathroom and serving up cheap iced coffees. I grab a crate from Jimmy and fill it up with an assortment of produce, bread, pie, and juice from all the vendors. Harry escorts me over and introduces me to the owner. He apparently doesn't come to the restaurant often, so I'm glad to have the opportunity to thank him. He happily accepts. 3:30 p.m.: An indie film location scout approaches us about using farmers' stands in a scene they're shooting in Tompkins Square park. 4:00 p.m.: Look at the salsa-off list and 3 more people have signed up! 4:30 p.m.: Haifa from Norwich Meadows finds out that I don't really eat meat. "You'll have an amino acid deficiency when you get older!" she exclaims, and thrusts some chicken into my hands. 4:45 p.m.: City Harvest arrives on the scene. They double park on 7th. I meet this week’s volunteer and give them some bags to collect unsold produce from farmers to donate to pantries. 5:05 p.m.: The first of Toigo's three trucks arrives from Carroll Gardens, soon followed by their second, much larger truck from Stuytown. Pura Vida packs up a little late, so these two trucks are double parked on 7th. I move my van and Acevedo's small truck so I can fit the smaller Toigo truck in. 5:15 p.m.: Pura Vida leaves but Toigo's big truck can't make that wide turn from 7th onto Ave A because of the City Harvest truck that is still double parked. I ask the CH driver if he can kindly go around the block to let Toigo through. He's cool about it. 5:20 p.m.: All the farmers have packed up for the day except for Meredith's, so now it's my turn. Play van-tetris for a half-hour getting all of the weights, tables, tents, bins, a-frames, racks, and banners in order. 5:50 p.m.: Forgot about the a-frame I have on 1st Ave. Run over and pick it up. 6:00 p.m.: Get a few bags of peaches, plums, and nectarines from Toigo, who are usually the last to leave. 6:10 p.m.: Say my goodbyes and start packing my backpack and bike panniers. Got too much stuff again, have to bungee some squash and peppers on the top of my bike rack. 6:15 p.m.: DANG! Somehow a peach got into my bag of EBT supplies and smashed right up against the keys of my terminal. Classic! Read more about Be a Greenmarket Market Manager! Stepping into the hydroponics classroom at PS 208m The Alain L. Locke Magnet School for Environmental Stewardship, several fifth graders sat huddled over small tanks in front of them. They were adjusting and observing the miniature hydroponics systems they had designed and built themselves. Behind them stood the rows of basil, rainbow chard, and lettuce they’d been tending in the larger classroom system that served as their model. The class, taught by hydroponics teacher Tina Wong, begins with the history and basics of hydroponics, includes lots of planting and harvesting (each student tends to one plant, and picks what they get to grow), and ends with a STEM-infused experimental design unit. Next year, students will test their know-how against the elements by expanding their garden – for the first time – outdoors. With the help of City Year and Grow to Learn staff, PS 208 built an outdoor garden area with raised beds in cheerful shades of purple, yellow, red, and blue. During the coming school year, students will run a small farmers’ market as part of their class, learning economics and business principles as they garden. Ask the students at Family Life Academy Charter School, the next stop on our tour, if they know a good place to get local produce, and they might just tell you their roof. During our visit, FLACS students could be spotted pulling young carrots straight from the ground, lining up at the hose for a quick rinse, and munching away. Between bites, students shared a variety of facts they’d learned researching different crops in the garden (originally, students had been asked to create labels for crops, but got so excited they would up making a fact-packed laminated brochure for every plant in the garden). The school’s chef, Chef Bennett, looked on proudly. He uses garden produce (especially herbs) in the school’s cafeteria, and uses the garden as a way to make healthy eating more appetizing, exciting, and understandable to the students that pass through his lunchroom. We were lucky enough to stay for lunch, and enjoyed a fresh salad bar, roasted cauliflower, and other healthy treats! At Bronx Lighthouse College Prep Academy, students spoke eloquently about the hard work and long hours they’d contributed to the garden. They shared their different roles (from seed-purchaser to resident photographer), their garden struggles (a four-flight bucket brigade to bring soil to their terrace garden came to mind), and the rewards of all their hard work – like pesto from garden-grown basil served in the cafeteria. Currently in their second season, the Bronx Lighthouse College Prep Academy gardeners felt more seasoned, and expected to produce over 400 tomatoes – a bumper crop compared to the four they said they harvested last year! We ended the day with a sweet surprise at PS 154x Jonathan D. Hyatt: members of the Chicken and Garden Club greeted us at the garden gate with a bucket of freshly picked raspberries. Older students, about to graduate, showed up-and-coming Garden Club students the ropes: from watering, to weeding, to eating radishes straight from the ground. Most exciting, though, was the run on the far side of the building where “The Ladies” live. Four hens (Storm, CoCo, Tami, and Diva) live and roost in a coop and run abutting Alexander Avenue, and are a constant source of curiosity and delight for teachers, students, neighborhood residents, and passersby. 5:00 a.m.: Alarm goes off. Hit snooze. 5:09 a.m.: Alarm goes off again. This time, I get up, a bit sleepy. I put water on for tea, make a big bowl of cereal with thawed out berries from the freezer, and check the weather forecast. It only feels like 30 degrees, so that means I only have to wear three layers of pants today. Woohoo! 5:35 a.m.: Take the puppy out for a quick walk. It's quiet out there, and yes, it's feeling pretty warm (for February). 5:45 a.m.: Make a green smoothie to bring for lunch. It's loaded with Gajeski Produce spinach, and fills a quart-sized mason jar. Perfect. 6:00 a.m.: Publish a 79th Street update to Facebook, grab my compost, and I'm out the door. 6:10 a.m.: Arrive at market. Carlton from King Ferry Winery has arrived, so I say hello and we chat about the weather. I've found, in Greenmarket, just as in farming, we talk about the weather a lot. I also note the one car parked in our lane. 6:15 a.m.: Organize my stuff for the day, relishing in the relative quiet of an early Sunday on Columbus Avenue. 6:40 a.m.: The northern Manhattan van has arrived. Phebe is here! We start unloading tents, tables, bins, signs, and loads of other equipment. 6:45 a.m.: Red Jacket Orchards, one of our new producers at 79th Street, has arrived. A few phone calls and texts later, I get them settled into their space. 6:55 a.m.: Back to unloading the van. A table here, a tent there. 7:15 a.m.: Greet farmers and workers as they arrive. I chat with Nikki from Hot Bread Kitchen about a few food happenings in the city. Jerry, our compost coordinator, has arrived, so we catch up. The whole time we're talking I'm scanning through the market, keeping an eye out for anything that needs attending, or anyone who needs help. Early morning at 79th Street often leads to lots of vehicle maneuvering. 7:40 a.m.: Today's a coffee kind of day. I run over to World Coffee across the street. 7:45 a.m.: Troubleshoot, problem solve, take phone calls, answer texts, greet new vendors, and figure out placements of stands. All in a day's work as a market manager. 8:15 a.m.: Someone's waving for me to greet the tow truck driver. I run over to show which car needs to be relocated. 8:25 a.m.: Set up our information tent and display. We've got a whole bunch of literature to display, so I set up the apple crate and baskets and make a basic set up before my coworker Nicole gets to market at 10:00 a.m.
9:00 a.m.: Walk through the market again. I like to say hello and check to make sure everyone has shown up on time. We have two new vendors this week - Red Jacket Orchards and Mountain Sweet Berry Farm - that means it's time for a little social media. I take photos of their beautiful displays, and do some promotion on Instagram, Facebook, and Twitter. 9:15 a.m.: Brainstorm with Jerry about how to get the word out more about our composting program. We fill 13 bins most weeks, but know we have a lot more people to reach. I chat a bit with a local food blogger about having her do a food demo for us this spring. She mentions dumplings, which sound like a great idea. 9:30 a.m.: It's market report time! I go to each producer and check them off for all types of at-market rules: arrived on time to market, tent secured, farm sign displayed, price signs displayed, purchased items sign up, baked goods ingredients sign up, and all kinds of other things. I take my time making sure everything looks in order. 10:20 a.m.: Rinzin from Knoll Krest hands me a lemon tart to try. 10:30 a.m.: Head back to our tent to say hi to Nicole, who manages 79th Street's promotions and EBT. We chat about the upcoming day, as we're planning to celebrate Chinese New Year with longevity noodles and poem writing. 10:45 a.m.: Brian of Gajeski Produce stops by the tent to greet us. He always checks in on Sundays. 11:00 a.m.: Design a sign for our new vendors, and bring it to the composting center to display. 11:10 a.m.: Andrew's arrived. He's our weekly volunteer, which is a huge help at this market. I start out by asking him to give breaks to farmers. 11:20 a.m.: Green smoothie drinking and Chinese New Year poem writing time. While writing, we have a few customers stop by to get EBT and debit/credit tokens. 11:45 a.m.: John from Red Jacket hands me a hot cider. 12:00 p.m.: Nicole and Andrew are busy preparing the noodle dish, so I make the rounds to give breaks to anyone working on their own. I break DiPaola Turkeys and Ronnybrook, Hudson Valley Duck and Berkshire Berries. 12:50 p.m.: Check in on the demo. It smells delicious. Our regional coordinator, Margaret, has stopped by, so we chat and I get some more social media going with photos of the noodles. 1:40 p.m.: More breaks! This time it's with Francesca's Bakery, Knoll Krest, and Lavender By the Bay. As I make my rounds, I check in with producers to see how the day is going, and grab a white bean and collard greens turnover from Body & Soul Bakery. The market's been hopping with this gorgeous springlike weather and lots of people are out and about. 2:45 p.m.: When I check in with Las Delicias, I get handed a chocolate Chunk of Heaven. It sure is. When I check-in with Divine Brine, I get handed a Devilish Dill pickle. I declare that it's my new favorite Divine Brine pickle. 2:50 p.m.: I'm back at the tent to find one of our regular customers. She always stops by with her two little Yorkshire Terriers, so I tell her how we're planning to do a dog portrait day this spring. We look at a potential spot for setting it up, and talk about potential volunteers. 79th Street is a big dog market, so we're hoping it'll be a big success. 3:00 p.m.: Nicole's off to do token redemptions with the farmers, so I stay at the tent. 3:15 p.m.: Phebe is back from Columbia Greenmarket early! I start packing up the bins and chat with a few customers about the day's food demo, recipes, and Greenmarket's requirements for selling at market. 3:50 p.m.: Nicole is done and back at the tent, so I gather up my things and we chat about possible food demos for next week. We're always scheming with promo and demo ideas. 4:10 p.m.: I see a very familiar-looking puppy out of the corner of my eye...it's my husband and puppy, here to pick me up! I'm done for the day, so we wander through the market, picking up greens, eggs, and lavender sachets along the way. It's been a long day, but one with beautiful weather, and of course, lots of great food. GrowNYC's School Recycling Champions program works with schools in all five boroughs to help them achieve and exceed the NYC recycling standards. They work to inform and empower the key participants in a school by providing hands-on education through materials, workshops, assemblies, and on-site demonstrations. Recycling Champions has five outreach coordinators, each of whom works in a particular borough. Below, Manhattan Outreach Coordinator Julia Goldstein takes us through a typical day in her life as a Recycling Champion. What I love about being a Recycling Champions coordinator is how much creativity and dedication the principals, teachers, custodians, kitchen staff, recycling coordinators, parents, and above all the students, all over the city bring to making their school environment more sustainable. The first stop of the day is my office, where I pick up materials for workshops I’m doing on the new Organics Food Scraps Collection program at Chelsea Prep (281 9th Avenue in Chelsea). I make sure to grab a coffee from Laughing Man on the way to the C train. In the 2013-2014 school year, over 300 schools in Staten Island, Manhattan, and Brooklyn are participating in the Organics Collection Program, a joint initiative between the NYC Departments of Education and Sanitation. The goal is to collect the organic material from school cafeterias and kitchens to reduce the waste NYC sends to landfills. Organic Food Scraps Collection includes: meat, fish, dairy, vegetables, fruit, grains, baked goods and all soiled food service paper products. I hop back on the C to 110th Street to my second stop: Wadleigh Secondary School for the Visual & Performing Arts (215 W 114th Street in Morningside Heights). I touch base with Al Spechar, the Custodial Engineer, who shows me a new system he is trying for separating the curbside recycling – he has painted green lines around where the paper recycling goes, and hung a mixed paper and cardboard recycling decal. Great idea! It makes it easier for the Sanitation workers if it’s always in the same place, and it makes it easy to check to make sure each type of recycling has been put out. I jump back on the C train to 86th Street and go on to my next stop: Louis D. Brandeis High School (145 W 84 Street in the Upper West Side). I check in with Helena Fisher, the SchoolFood Manager , to see how the Food Scraps Toter bins are working for them. We talk about how frequently they need new bags – the students are catching on to the Food Scraps Organics program faster than we had hoped! I board the cross town bus and grab a seat and work on email. I spend so much time on public transportation it feels like my second office. My next stop: Robert F. Wagner Middle School (220 E 76th Street in the Upper East Side). I meet with the 6th grade cafeteria recycling monitors, who make the fantastic recycling station work every day. They bring both knowledge and tact to the job of reminding their peers of the recycling rules. I take the 4/5 back downtown to Brooklyn Bridge/City Hall for my final stop of the day: Murry Bergtraum High School (411 Pearl Street in the Financial District). The sustainability coordinator, Bob Menning, walks with me through the school. Bob takes his role seriously and his energetic and talented Green Team students, like Elena Tsoy, bring creative flair to the task -- they’ve hung signs throughout the cafeteria and school reminding classmates and faculty/staff of best recycling practices. That’s my last visit and all that’s left is to convince my fellow rush-hour passengers on the 4/5 train to make room for me and my Santa-sized bag. To their credit, being New Yorkers, they hardly give it a second glance.